Multipurpose Social Media Banners is an awesome collection of 8 different templates perfect for promoting your products and services using web advertising on social media channels. 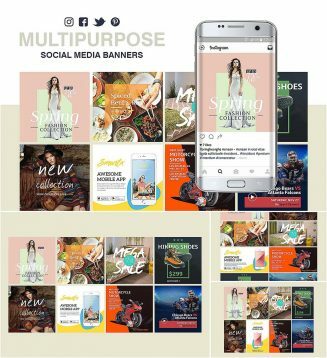 The banners are optimized for social media posts through Facebook and Twitter, Instagram, Pinterest or blogs. Tags: advertise, banner, blog, facebook, instagram, pinterest, post.